Last Friday, I found myself in the West Village with Lisa, once again to celebrate our upcoming birthdays this month -- another year gone by. We had celebrated at Atera last year, so we thought to return to our alternating tradition of New American and Japanese. Soto had been on our list for the longest time, making it a fitting choice of venue for us this year. The restaurant resides right on Sixth Avenue, but even then, its exterior is pretty unassuming. I nearly passed it at the first go. Like a well-kept secret in the middle of the neighborhood's hustle-bustle, Soto is hidden away behind these windowed walls with smaller cut rectangles speckled throughout. Once inside, the restaurant is serene and pretty quiet -- just the occasional echoes of service plating and soft chatter. It is a temple for Japanese cuisine. The menu is dated, which implies it is updated daily. There are about fifteen or so items on each side (two pages, front and back), so there were quite a lot of dishes from which to choose. And in case you were wondering if there was ever a restaurant offers an emporium of sea urchin on its menu, Soto is that very spot. There are nearly ten dishes that contain it alone. That's a whole lotta uni -- you can bet your bottom dollar that we got on board with that right away. Let the uni feasting begin! Our waitress guided us through the menu, suggesting that we sorder about twelve dishes in total from the menu -- roughly four from each page of the menu if you're not getting any sushi/sashimi (we decided to focus on the menu dishes rather than the sushi selection as there were many original creations to explore). We could only really decide on eight definite dishes ourselves, with the remaining three selected with help. We started with sharing the miso soup -- lobster and uni broth, sliced fresh ginger shoot, and chives. 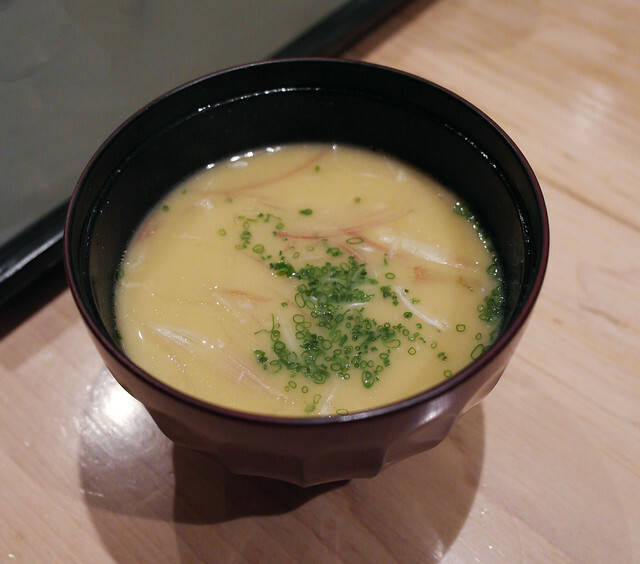 It had those clean yet profound flavors that you would expect from a solid miso soup, yet there was a really interesting twist with the added savories of plump lobster meat and creamy uni as well as a flavor highlight from the freshly sliced ginger. I highly recommend starting out your dinner with this -- very fun as it paints your palate for what's to come. This next dish made up for the previous mishap. We were very curious about the ankimo -- steamed monkfish liver with ponzu and scallion -- one of our favorite Japanese dishes. I've only had it a couple times before (incidentally, my first time ever trying it was with Lisa at Ichimura at Brushstroke), and just with those experiences alone, I can tell that it must be difficult to prepare it well, as much of the flavor comes from the quality of liver. I am happy to report that the ankimo at Soto is fantastic -- savory and creamy all at once with the perfect balance struck with ponzu and scallion. The rounded cuts in the back and the square-ish cuts in the front each had slightly different textures, the square-ish being a bit softer and more buttery. 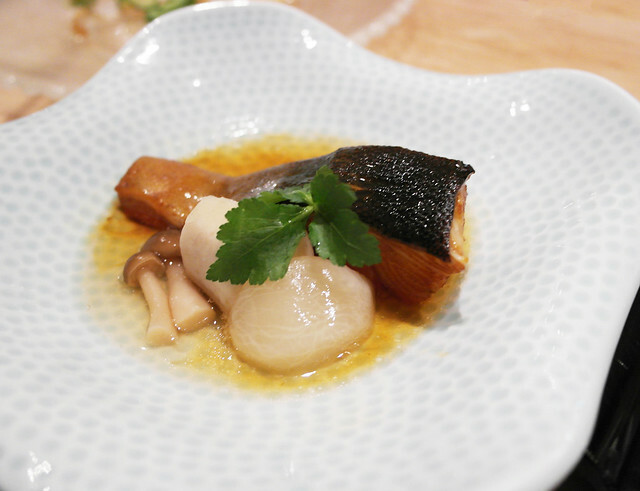 Almost quite literally the foie gras of the sea, this is a dish that cannot be missed. Also from the small plates section was uni and yuba -- black soy bean milk skin with the restaurant's finest uni and served with shiitake broth and shredded nori. Look at those golden lobes of uni roe, glistening atop the silky heap of yuba in a flavorful broth. This was a very delicate dish, one that had a lighthearted interplay between rich, savory minerality (the uni) with the clean, silken feathers (the yuba) swimming in a broth that captured the beautiful essence of the shiitake. You wouldn't think this unusual combination would work, but it magically does. Another dish from the sushi bar was the tuna tartare with chopped big eye tuna, pine nuts, Asian pear, cucumber, scallion, sesame seed, and shredded nori in a spicy sesame sauce. For me, this was probably the most vibrant and playful dish of the evening (even more so than the octopus carpaccio), if merely because of the deep magenta colored tuna mixed with the greens of chopped cucumber and scallions and the pop of the cream-colored, shredded Asian pear. 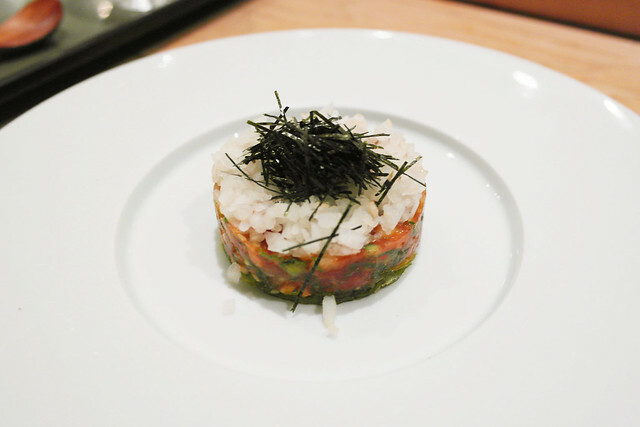 This may have seemed like your typically Americanized tuna tartare dish, but I thought the addition of pine nuts and Asian pear made it really unique. It had fun textures (refreshing crunch from the pear and a nuttiness from the pine nuts) and interesting flavors blending together (again, the sweetness of the pear with the more savory nature of the remaining ingredients). It was a brightly painted dish in many aspects, and if you're a tuna lover, this is right up your alley. Returning back to the sushi bar menu, next came the uni ika sugomori zukuri -- Soto's finest sea urchin wrapped in a thinly sliced squid with shiso, quail egg, and tosa soy reduction. There was SO much going on with this dish -- we had to take a few moments to brace ourselves with how to properly proceed eating it. It totally looked like a bird's nest, with the shredded nori as the nest and the quail egg yolk emulating the unhatched egg. So we just decided to say, Screw it, and we just tossed it all together -- it was gonna taste however it was gonna taste no matter what. What a gorgeous mess, right?! Hahaha, oh man. Anyway, this course certainly made for a memorable one, as the strings of squid were like udon noodles and the uni and everything else were like the sauce. It reminded me of a combination of dishes I've had at Yuji Ramen (i.e., the broth-less uni miso ramen) and Sakagura (i.e., the abundance of shiso in the uni soba). For me, it was the remarkable texture of all the ingredients that made me fall in love with dish. Lisa just said it was her favorite -- done and done. Another dish from the kitchen, the shiso agedashi -- deep-fried shiso wrapped scallop and fluke served in dashi broth -- was something recommended by our waitress. 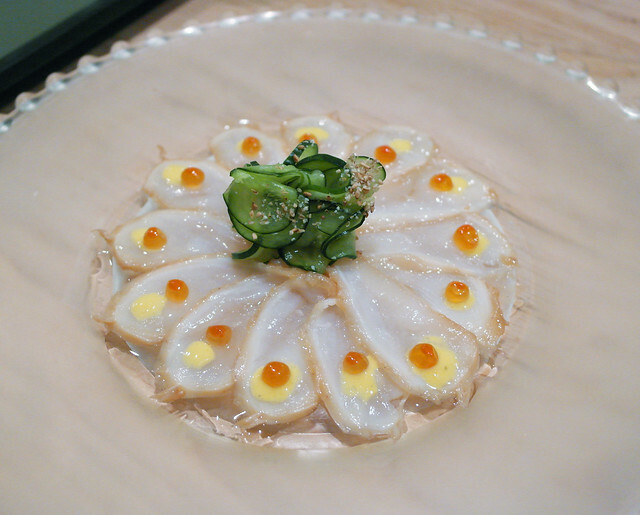 The scallop and fluke were well-battered (it had that golden, loose crunch) and had a great dashi broth, but other than that, it wasn't necessarily anything else noteworthy to add. It's a great basic dish, but there are other items on the menu that are probably worth exploring if you're looking for something more out-of-the-ordinary. Geez, Soto really nails it with the plating -- here's yet another awe-striking sight, another one from the kitchen: layers of steamed Maine lobster with uni mousse in lotus wrap, daikon radish, and caviar, all under dashi broth. The uni mousse had us pretty curious, and sure enough, it gave the steamed lobster an alternative dressing (as opposed to the typical melted butter) to go with the Japanese touches of lotus wrap and thinly sliced pickled cucumber. The briny-ness from the caviar added another dimension to the clean flavors of the lobster and the creamy butter of the uni mousse. Overall, a well-curated dish. The last dinner course for the evening was another recommended by our waitress (one that I am glad we didn't miss out on!) -- lightly broiled New Zealand langoustine under shiitake sauce and covered in thinly sliced shiitakes. I've never seen a langoustine in its shell before, so guess I can finally cross that off my list! The presentation here is undoubtedly captivating, and upon diving into the broiled langoustine forks first, it was so perfect -- easily the most savory dish of the evening (suggesting the dinner's course progression from refreshing to savory). The meat was at the ideal temperature (lightly cooked) with the lightest coat of a delicious cream over which the thinnest mushroom slices were layered. It all came together as a beautiful synergy of rich flavors, surprising me how this could easily be my favorite at Soto (and thereby making this one of the can't-misses). Lisa and I could never end an evening at a Japanese restaurant without dessert of some sort (usually just a couple scoops of green tea ice cream) so the shared platter of assorted mochi ice cream (left to right: strawberry, green tea, red bean, vanilla, and mango) really hit the spot. Findings: If there's something true about Soto, it would be that it takes the cake for having the most uni offered on a dinner menu (as the main ingredient or an accompaniment) AND that these dishes are outside of the typical offerings of just uni sushi/sashimi or uni pasta/ramen. If sea urchin is something you love and dream of, then you have come to the right place -- Soto will totally satiate any and all cravings. Along with the creative uni-inspired items, Soto is also quite imaginative in its plating and presentation -- we were thoroughly impressed with the beauty and precision of all our courses. So with that in mind, while we loved the majority of the things we ordered (a little over half, give or take), we were also underwhelmed by the other courses which made us question the restaurant's two-Michelin star rating. Bearing cost in mind (it is pretty hefty at roughly about $100 per person, before gratuity), I'm not sure how confident in recommending a trip here, given the ratio of wows and mehs that we balanced that night as well as the vast offerings on the menu that we didn't have room to try. With Soto, you should definitely go with recommendations (like the ones I gave above) from seasoned diners so you can be sure to hit all of the can't-misses. All in all, I'm going to err on the side of favorability and say that if you're looking for a culinary adventure in the realm of Japanese creativity, then Soto will be that place for you. Lisa and I didn't have a chance to tackle the sushi/sashimi by-piece/omakase available (a whole separate beast, in my opinion), so I would definitely be willing to return to check that out. In the mean time, please enjoy the photographs that documented our birthday celebration at Soto! Price point: $9-18 for each small plate, $16-26 for each dish from the sushi bar, $14-28 for each dish from the kitchen.